Skoda Auto India has started its proceedings for 2019 with the launch of the Superb Corporate Edition; exclusively on sale for existing Skoda customers only. Skoda Auto India Pvt Ltd (SAIPL) has launched the Superb Corporate Edition in India at an ex-showroom price of ₹ 23.99 lakh. However, it's on offer only for existing Skoda customers. The Corporate Edition, as per the company, is aimed at providing its customers with a value-for-money proposition. Otherwise, the standard Superb range starts from ₹ 25.99 lakh (ex-showroom) for the 1.8 TSI Style variant. Like the standard car, the Superb Corporate Edition gets a 1.8-litre TSI petrol motor which churns out 178bhp and 320Nm of torque. While Skoda is still contemplating an automatic version, for now, customers will have to make do with a manual transmission option only. 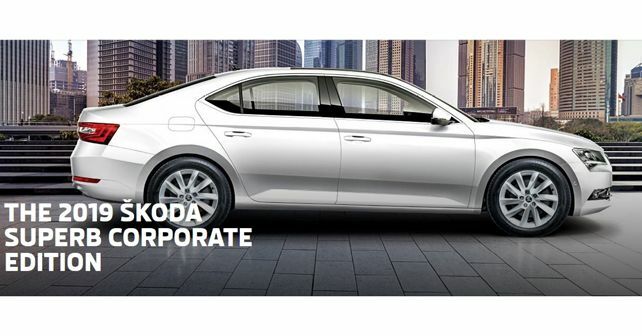 Thus, with a manual box, Skoda claims that the Superb Corporate Edition is capable of delivering 14.64 km/l, which is a decent figure for a car of its size. Other than that, it will be offered in just two colour choices: a Candy White and a new Magnetic Brown. In terms of features, the car gets a 20.32cm floating touchscreen display with a proximity sensor. The touchscreen acts as the interface for a new-generation Amundsen infotainment system. The infotainment system is being offered with SmartLink which allows seamless connectivity support for MirrorLink, Apple CarPlay and Android Auto. The rear seat occupants can also control the radio, music and navigation settings with the help of the Skoda media app. Other convenience features include three-zone climate control with a clean air function and a humidity sensor which minimises misting on the windscreen. The Superb Corporate Edition also scores big in terms of practicality and safety tech. Safety features on the car include eight airbags, Adaptive Front Lighting, a Multi-Collision braking system to name a few. With all seats up, the boot capacity stands at 625 litres whereas with the rear row of seats folded, the capacity increases to 1,760 litres. Like all its models, the Skoda Corporate Edition will also come with the brand's 4-year service care program which includes a standard 4-year warranty and 4-year Road-side assistance. An optional 4-year service package is also available for purchase.